Blaer Bjarkardottir, a 15-year old Icelandic girl, can now legally user her first name. Iceland’s authorities would not let her use her first name “Blaer”, which was given by her mother when she was born. In her bank papers, passport, and other official papers, she was called “Stúlka”, which literally translates to “Girl”. Blaer took the matter to court, and won the case. The Icelandic Naming Committee is very strict about the names given to children in Iceland. You can pick amongst the some 2,000 boy and 2,000 girl names. If the name you want for your baby is not on the list, you need to get approval for it from the naming committee. The committee doesn’t allow names using letters that are not in the Icelandic language and they don’t allow the same name to be used for a boy and a girl. They also don’t allow a name that could be embarrassing for a child. In Blaer’s case, her mother didn’t realize that the name she had chosen was not on the approved names list. The naming committee found the name “Blaer” to be more of a boy’s name, and did not okay it for a girl. Unlike many countries, in Iceland, people are referred to by their first names. Even the telephone book lists people by their first names. The last name usually identifies who a person’s father or mother is. For example, the prime minister of Iceland is Johanna Sigurdardottir. Her last name “Sigurdardottir” stands for “Sigurdur’s daughter”. Her father’s name is Sigurdur Egill Ingimundarson. Iceland is an island country known as “the land of fire and ice” because it is home to many glaciers, volcanoes, geysers, and hot springs. The island is filled with thermal swimming pools, which are heated naturally by underground volcanic activity. 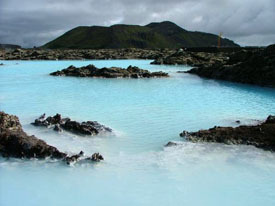 One of the most famous pools in Iceland is The Blue Lagoon. Did you know? “What’s in a name? That which we call a rose by any other name would smell as sweet.” is a very famous quote from William Shakespeare’s play Romeo and Juliet. Did you know? The world’s most northerly capital is Reykjavik, the capital of Iceland.